I knew I would be reminded of a lot of historical facts that had escaped me when I went to see Young Tom Jefferson at Historic Hanover Tavern. I didn’t know that I’d learn so many fascinating new facts about this important time in Virginia’s and our nation’s history . I mean, really, how have I gone all this time not knowing that Thomas Jefferson and John Adams both died on the fiftieth anniversary of the day they signed the Declaration of Independence, July 4, 1826? I was worried that my four year-old might get bored with this one, but once I learned it was just an hour long, I decided to bring him along. The up close and personal setting, combined with the talented and engaging actors and the eight musical numbers over the course of the performance were enough to keep him entertained. My six year-old came home with lots of tid-bits about Jefferson and Virginia for Dad, and he can’t wait to get to school on Monday to tell his teacher all about the things he learned. If what will soon be astoundingly beautiful fall colors decorating our state’s landscape aren’t enough to make your Virginian heart swell with pride, spending an hour listening to the six cast members of Young Tom Jefferson recount Virginia’s role in our nation’s beginning will. If you happen to be a William & Mary grad too, your head may well swell to the point of not fitting in the tiny theater by the end of the play (I just managed to squeeze my way out). All these years after college graduation, I finally know where all of the dorms and halls got their names…and my kids are nearly forty years ahead of me with this knowledge, thanks to the gang at Virginia Rep. It didn’t hurt that we got to catch the performance at the scene of one of Jefferson’s historic meetings, Historic Hanover Tavern. Listening to the actors talk about Monticello, Shadwell, Tuckahoe, and the building we were sitting in was a great reminder of the many wonderful places we have to take the kids in this great state. Virginia is so incredibly rich with history, it almost makes me feel bad for the other states! 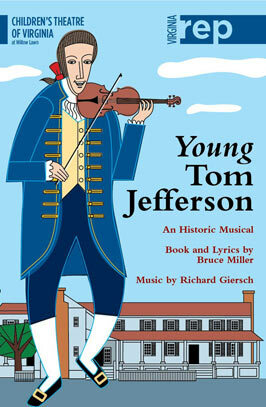 Young Tom Jefferson runs through October 12th at Hanover Tavern and October 19th – November 2nd at Willow Lawn. Purchase tickets at www.va-rep.org or by calling (804) 282-2620.